You are here: Home > Topics > Pro Projects > Not So Pro Projects > Exterior wall fail!!! This topic contains 34 replies, has 10 voices, and was last updated by DirtyWhiteBoy 5 months ago. 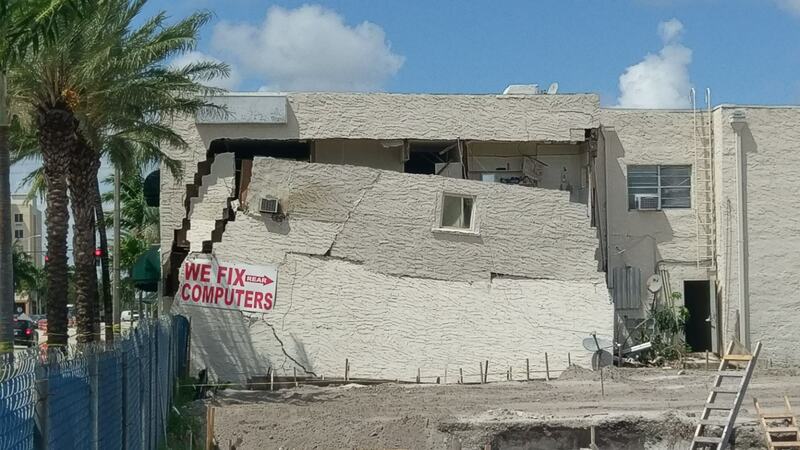 So this is a building in south florida. Exterior walls concrete block stucco. Next lot over they are doing demolition. Tearing down the whole building and regrading. Half way through the demolition, this building wall collapsed. The entire wall failed and came apart and you can actually see the interior living space! Wow how does something like that happen. I know you guys do shallow foundations in Florida but I can’t see the sand transferring vibration enough to jar the earth. From the photo’s it appears that the wall is unreinforced. Not something I would expect to see in a hurricane prone area. We would not build unreinforced masonry walls like that in our area. The building is almost 100 years old, it was originally constructed in 1924. Next door was excavating very close to that wall. They actually broke water pipes prior to the collapse but fixed it. Building across the street on the other side said they can feel the vibration when the excavation was going on. Yup a little rebar and grout go a long way.. It was built before there were any codes. It was ready to go anyway. The infrastructure was shot anyway. Yes lack of codes and sound building practices almost a hundred years ago resulted in that failure. I am always amazed how some buildings of that era are built so sound and weather the tests of time so fail miserably at it. It seems that then, like today, some builders gave a crap and actually built to last while others worried more about fast and cheap. Looks like typical Latin America wall construction. Very poor brickwork covered with stucco and little to no rebar to support it. That might be the catalyst for the failure in that the water leak washed away too much sand/dirt near it and led to its support being compromised and ultimate collapsing failure. 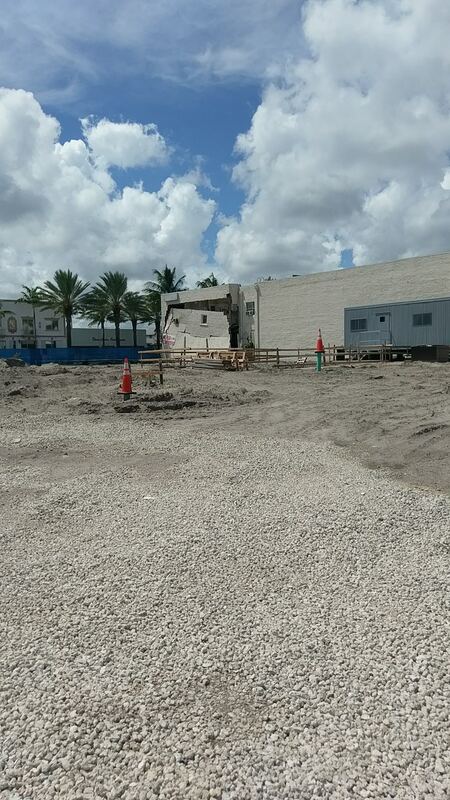 Meanwhile the city has closed off two lanes of US1 which passes in front of the building. Now the DOT, city, owner, insurance and next door owner are involved in a legal mess while the road is half closed. I am sure they are looking for someone to ultimately blame. The owner still wants to “shore up the wall” and has submitted a permit application. “Just days before, tenants say they kept hearing a thunderous drilling noise that made the walls shake. “It felt like the walls were going to come down,” said Jennifer LeClaire, a pastor who had rented space in the building for more than two years. 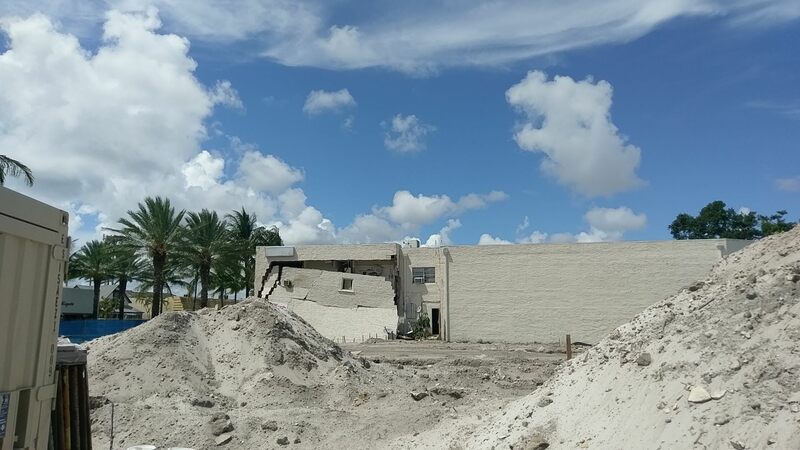 Broward County fire rescue concluded it is the trenching digging for the next door hotel that caused the wall to collapse. 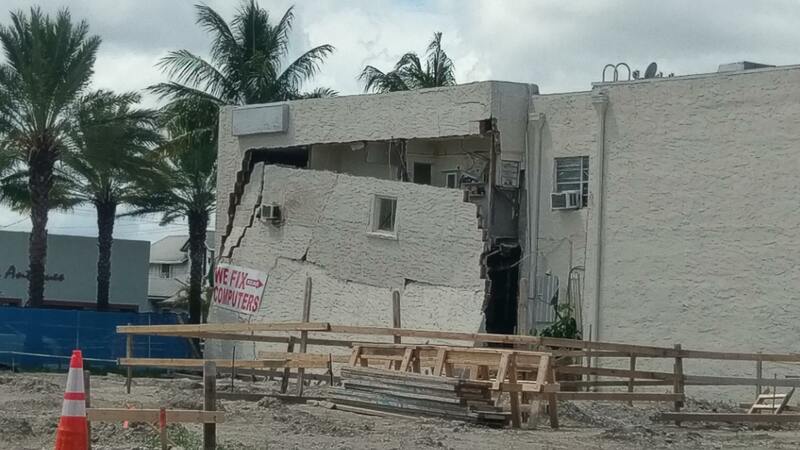 I bet a forensic structural engineer will be called in to do a $150k report though. Looks like typical Latin America wall construction. I think this was built long before the Hispanics came in Florida. Maybe redneck building lol..
You got that right. When stuff starts falling down around you, it’s not a difficult decision to make. Probably right, somebody will also probably get sued in the end. they must have been digging fairly close to the wall or fairly deep for that to happen. Still scary to have happen. They said there is a bathroom right there, imagine mid way through a shower and the wall fell out two feet? I’m not sure, but I think now they have codes to put some sort of protective coatings on the rebar? Maybe kurt@welkerhomes.com and DirtyWhiteBoy might be able to add to the rebar coating?